Devolve has many international developers on board to help build this global blockchain. Distributive technology improves capital mobility with borderless investing in the $217 trillion real estate industry by disintegrating the barriers of conventional real estate investing and realizing extraordinary returns. Real estate investors enter the market as a speculator, end user or long term investor who use the most common investment strategies of buy & hold, renting/leasing and flipping property. These strategies are highly saturated due to their ease of entry and respectable profitability margins. Home purchases are long term investments where future appreciation is exposed to market fluctuations and economic factors. Renting property produces remedial returns and includes the burden of property management. Flipping property generates modest returns, but lack of time, money and knowledge adversely impact profit margins. Property development offers all the common benefits of investing in real estate such as stability, leverage, inflation resistant and increased equity, with the addition of producing high yields at an exponential rate. Unparalleled to conventional investment strategies, real estate development is the superior underemployed investment approach. Predominantly abandon by individual investors for the high barriers of entry, this wholesale strategy produces unprecedented returns in greater than traditional investment strategies. Devolve Developer leverages blockchain technology to remove the conventional barriers associated with development strategies, increasing utilization of this investment vehicle and producing exponential income for participants. Blockchain technology creates the opportunity to participate in the impenetrable primary real estate market to access global opportunities and earn exponential returns. In the multi-trillion dollar real estate industry, substantial profits are generated with the operation of property development strategies. 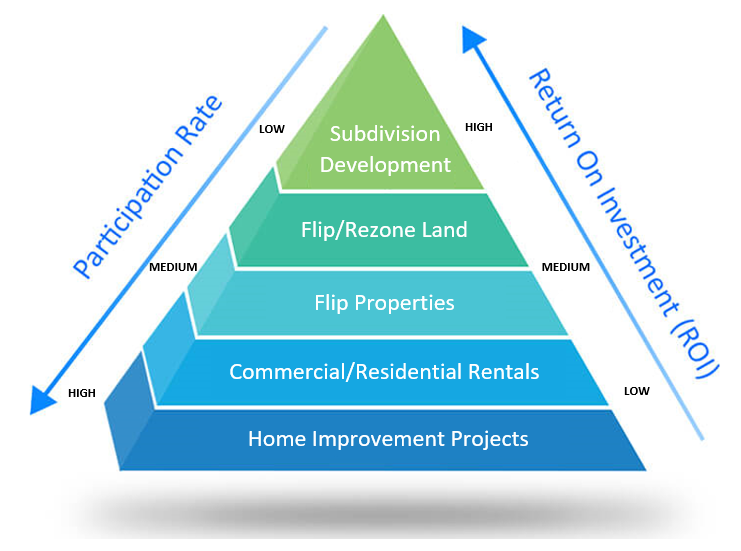 From land rezoning to building subdivisions, these strategies produce superior investment performance in contrast to renting and flipping property. As an ignored opportunity by most individual investors, profits are secured for institutional investment firms and accredited investors who can wield the challenges of large capital requirements and elevated inherent risks. Devolve Developer will alleviate the risks and barriers of real estate development and open the gateway to these high yielding opportunities. With the use of blockchain technology, the market will experience increased participation from individuals that will multiply global capital flow and fundamentally expand cross border income. Now individuals from all over the world can access the high returns of this investment environment. The need for a divergent real estate business model is preeminent. Devolve Developer’s digitized platform will be disruptive and leading edge, collapsing the challenges of conventional norms. A digital platform backed by tangible assets with the propensity for high profit margins and the independence to manage risk makes it attractive to all investors. The Devolve Platform is the first high quality platform backed by hard assets engaging in large real estate development projects suitable for both institutional and individual investors. With the use of smart contracts, Devolve Platform will automate real estate development projects by connecting participants with projects on a distributed platform that would otherwise not be accessible. The Devolve Platform assesses viable development project opportunities and grants access to everyday investors to participate. Acquired development projects undergo a rigorous evaluation process to determine the eligibility for the program. Participants can search and compare approved projects and allocate tokens to their selected projects to automatically earn rewards. Smart contracts will determine and manage the distribution of rewards based on the performance of development projects and the allocation the DVX token to participating token holders. Blockchain technology and smart contracts create a new paradigm for real estate development by removing conventional barriers and establishing a more effective ecosystem. Devolve token is a real estate asset backed token that is highly profitable, stores tangible value and ensures liquidity. Usable. Tradeable. Contribute. Devolve token (DVX) is the native token on the Devolve Platform and will be used for participating in development project opportunities and future platform programs. The blockchain and smart contract technologies will increase the utility of the Devolve token to include additional services and functionalities such as shopping among our merchant providers, property registration, property valuation and real estate transaction management. Build your portfolio with an exceptional rewards model and hedge against the highly volatile cryptocurrency market. Grow your portfolio exponentially creating a maximum token value. Select among the myriad of development projects generating high returns and create your personalized portfolio. Receive total transparency by using analytical tools to compare project performances to assist in your selection process. Leverage the hedging qualities of an asset backed token against the volatile cryptocurrency market. Further enhance the potential value of the Devolve token by allocating tokens towards your selected development projects to earn rewards. Manage your contributions with project updates and optimize your portfolio by exploring new project opportunities. Grow your portfolio with the flexibility to re-allocate your tokens between projects at any time without penalty. Devolve Developer is conducting a token sale for potential contributors to gain access to the high yielding real estate development marketplace. Devolve Developer secured the necessary partnerships from industry players with a current development project portfolio spanning across 3 continents and continuously growing. Avitesh Shrivastava, son of late singer-composer Aadesh Shrivastava and famous actress Vijayta Pandit, is the newest rising star on the Bollywood scene inheriting both of his parents’ talents. With a distinguished musical background, Avitesh spent many years composing music with his late father, working with acclaimed composers in Bollywood films such as Baabul and Baghban, and composing the title track of Amitabh Bachchan’s talk show Aaj Ki Raat Hai Zindagi. Launching his singing career in an international music video with two-time Grammy Award winner, Giorgio Tuinfort, Avitesh possesses a music portfolio consisting of popular songs such as, One for the World with his father and Akon, Angel of Peace and Aao Hum Tum Milkar. More recently, Avitesh is making his Bollywood acting debut by working on the latest film by renowned director Remo D’Souza. Take a look at why so many different celebrities from around the world choose to be a part of Devolve.